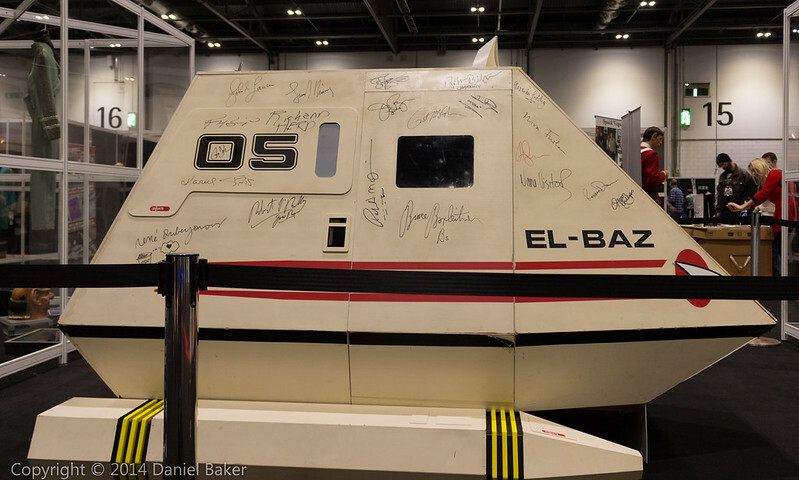 Sunday was Destination Star Trek 3, my Mother paid for me to go and also for some photoshoots with the stars of the show, it’s a big Star Trek convention held in the UK and something I’ve wanted to do since I was a child. 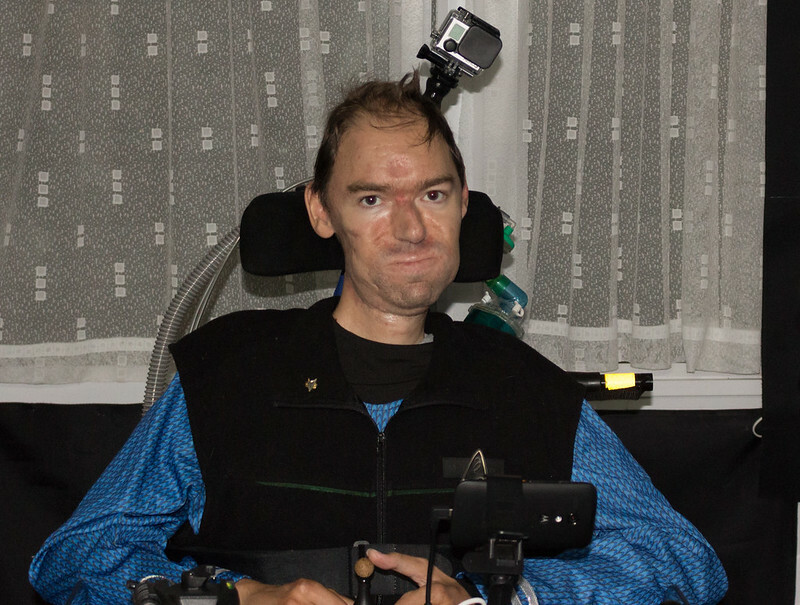 I ordered a few things before the show as you really have to dress up for these things, the stars appreciate it and over convention goers welcome you as one of there own, I had a science badge and uniform and added some battery powered LEDs to my chair, not over the top but just enough I think. We left at 7:00 am which meant me getting up before 6am, I didn’t get much sleep Saturday night, maybe three hours, so was awake at half six ready, the PA on duty was rather slow so we didn’t manage to leave early, we then picked up another PA who would stay with me for the dsy (Mum drove but had decided she’d rather sleep in the van than attend the convention). We made good time and were nearly in London by nine, that’s including a half hour stop at a service station (it was 5C when we were at the services, isn’t Autumn supposed to be a little warmer than that). The drive through London wasn’t as quick, over an hour to get to ExCeL and then more time finding the traffic office so they could direct us to a space. ExCeL itself had one lift and it was fairly large, much better than the pokey lifts at Birmingham NEC, we made our way to the information office and asked for a carers wristband for my PA, after getting this (which allows a carer free access to the show) we headed in through a dark tunnel with Star Trek music plating. 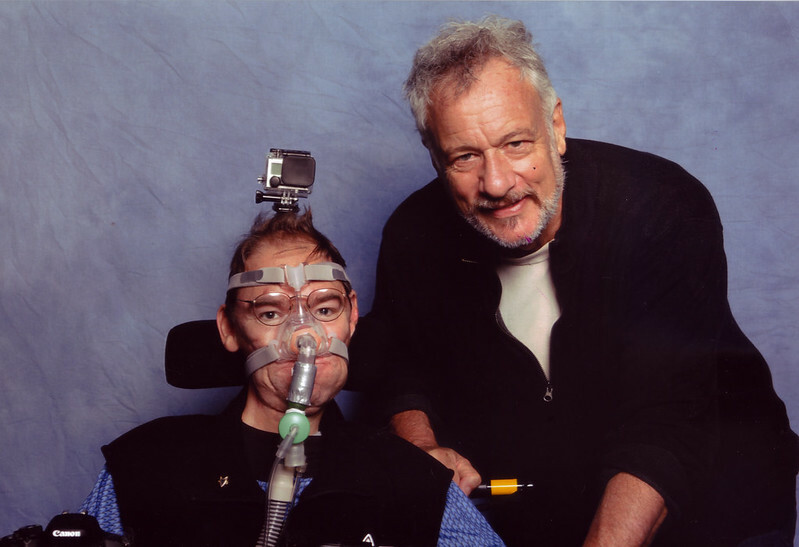 My first photoshoot was supposed to be with Robert Picardo who was probably my favourite Voyager character the doctor, unfortunately we were too late for that so I headed for my John de Lancie (Q) shoot instead, he was a nice guy and admired the gadgets on my tray, after this we had two hours to kill before the next photo shoot, my PA decided to ask if the first aid station could look after my spare ventilator as it’s rather heavy to carry around, she didn’t get very far with that apparently and returned with it shortly afterwards. 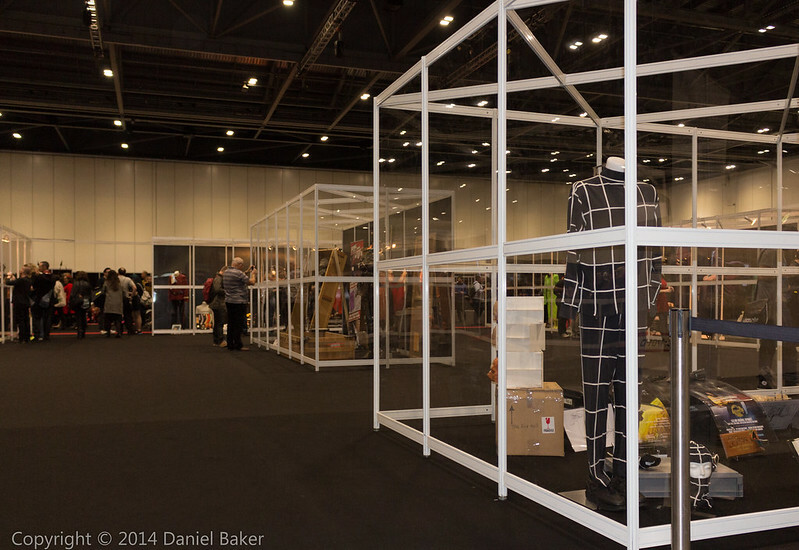 We then had a wander around the show, I was expecting it to be more busy and cramped, the stalls, exhibits and stages were spread out making it easy to look around without running people over but there wasn’t such a buzz as at other conventions I’ve been to and not really that much to look at. After this Mum rang, she was outside the show and wanted to check everything was okay and tell us where she parked, we met up and mentioned my back up ventilator so she headed to the organiser’s office, they were very nice and happy for us to store it there, they gave me a free programme as Mum mentioned it was an early Birthday treat, they also gave their phone number and said if there was an emergency to ring them as they could get the ventilator to us more quickly than we could get to them. 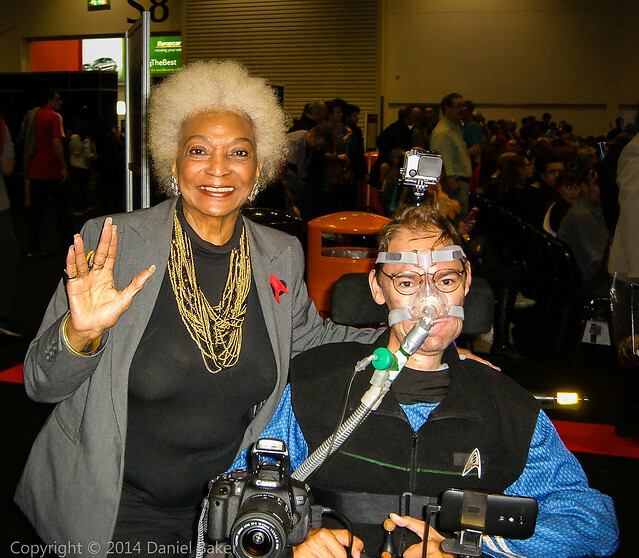 After wandering round and listening to bits of different talks I noticed Nichelle Nichols (Uhura) being pushed passed in a wheelchair, my PA, who is more of a Trek fan than me didn’t even notice, for a nurse she’s not really very observant, she was doing a couple of promotional phot9s and we caught her as she headed back out, she very kindly agreed to letting me have my photo taken with her and shook my PA’s hand (which made her day). Then as we continued wandering someone gave us some tickets to the Colm Meaney talk (O’brian) we quickly headed off, we looked all round but couldn’t find a manned entrance to the talk, very begrudgingly we gave up as my next photoshoot was about to start. The penultimate shoot of the day was with Jeri Ryan (seven of nine), they were running a bit late so we got to watch her and Alice Krige (Borg Queen) doing some photo shoots, both looked really lovely and Alice had gorgeous long hair. While we were waiting a man dressed as Seven of Nine (complete with red wig) came over and told me I was an inspiration, I’m not overly fond of these encounters, I am not used to complements and am terribly awkward when trying to reply, there’s also the patronising factor as I see myself as normal and nothing special except for the wheelchair, this man wasn’t being patronising though, it’s a hard balance to judge but he seemed generally happy I was there and I think that’s the thing, yes I may have felt a little awkward but bringing some form of happiness to another human being is more rewarding and important than a moment of thinking “oh no”, I’m actually glad he said it. The Jeri Ryan shoot was quick but she was lovely and extremely beautiful , she also mentioned the gadgets on my tray, I may actually have been slightly star struck for the first time as I just kept saying thank you! 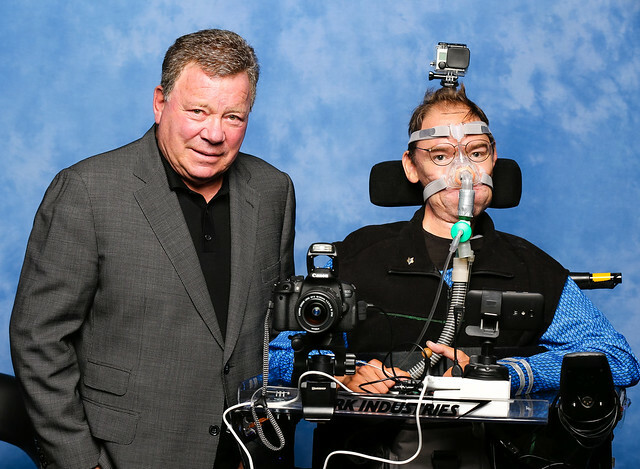 My final photo shoot was with William Shatner (Captain Kirk), I arrived slightly early and they let me go in and wait for him in front of the photographer’s backdrop, he didn’t keep me waiting and came in and said hello, then looked at my gadgets, I got a little more time with the legend than most people, a real honour. It was then time to leave, not long after 4 O’clock. The journey home was horrendous, we didn’t get out of London before seven, so much traffic and so many people, worse even than when we’ve visited on a weekday, eventually we reached the first service station where Mum had a well earned rest. I came over a bit faint and nauseous on returning to the van, I hadn’t had food or drink since leaving Cheltenham and it had been a long day (looking after my PA was exhausting too), it didn’t last long and I had a drop of cold green tea before we headed off again. We finally arrived home at about half nine, everyone was shattered, my PA had dozed in thee van and my Mum had slept while we were in the convention, yet I was still the most alert on just a few hours sleep the night before, I spotted a few mistakes before they caused an accident, sometimes I do wonder who the ill disabled person actually is. All in all it was a good day Star Trek convention goers were not the sci-fi snobs I had feared they might be, there were also far more attractive women there than I was expecting lots of whom smiled at me, I guess Trek fans are used to aliens so I can’t look too bad in comparison, it was well organised and a good event, bring on the next con! 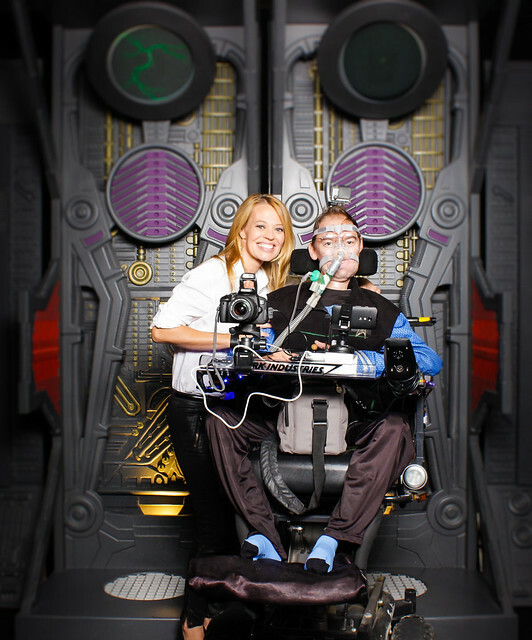 This entry was posted in Geeky, Health and tagged Daniel Baker, Destination Star Trek 3, disability, ExCeL, Jeri Ryan, John de Lancie, Nichelle Nichols, Star Trek, William Shatner. Bookmark the permalink.